Muxia lies at the very end of the Camino on the same stretch of coastline as Finisterre. 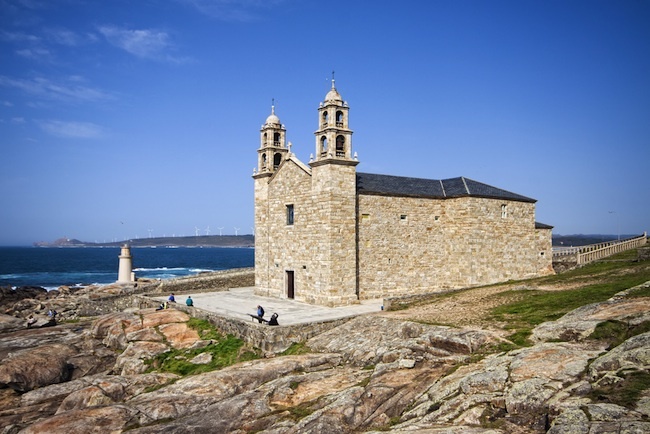 Pictured is the Nosa Señora da Barca church in Muxía built on the site of a pre-Christian Celtic sacred spot. This part of Spain was resistant to conversion to Christianity, and was only converted in the 12th century. After which time a hermitage was built on this location at first, and later the present church in the 17th century. Muxia can be reached in 3 days walking from Santiago and is a popular way for hardier Pilgrims ( and those with time) to finish their Camino experience.